The Gefen ToolBox 8x8 Matrix Switcher is a compact and lightweight alternative to rack-mounted matrix switchers. This HDCP 1.4 compliant matrix switcher routes eight Ultra HD sources to any eight 4K Ultra HD displays with HDMI inputs. Resolutions up to 4K DCI (4096 x 2160 at 24 Hz), 4K Ultra HD (3860 x 2160 at 60 Hz, 4:2:0 color space), 1080p Full HD, and 1920 x 1200 WUXGA are supported. 3D, Deep Color, and multichannel digital audio including 7.1 channels of LPCM and HBR (High Bit Rate) formats such as Dolby®TrueHD, and DTS-HD Master Audio are also passed through. 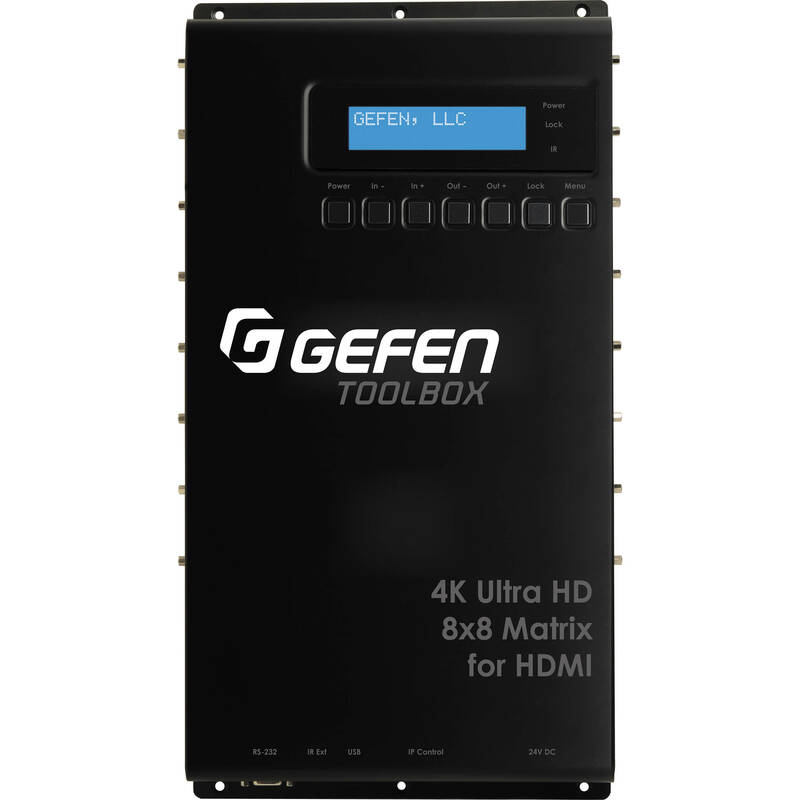 The Gefen Syner-G software's Discovery and Show-Me features simplify initial IP configuration of the ToolBox. Each source can be routed to any display location, using the front-panel push buttons or the included handheld IR Remote Control. The matrix can also be controlled via RS-232, Telnet, UDP, and web server interface. An easy-to-read backlit front panel display indicates the current routing status and IP settings. Box Dimensions (LxWxH) 19.37 x 12.126 x 4.724"